The result is I just took delivery of the AR in .223 from Mark Bradley and yesterday tested it at Bisley. Was very impressed with the build - no need for an accuwedge as from stock to handgrips there is absolutely no movement (am used to sloppy .22 AR's). Primary concern was extraction but am happy to report that it handled RG and Norinco 5.56mm perfectly as the SAMMI spec chamber is a very good universal fit. The action cycles like a dream with no effort required so it's far too easy to empty a mag in no time at all. 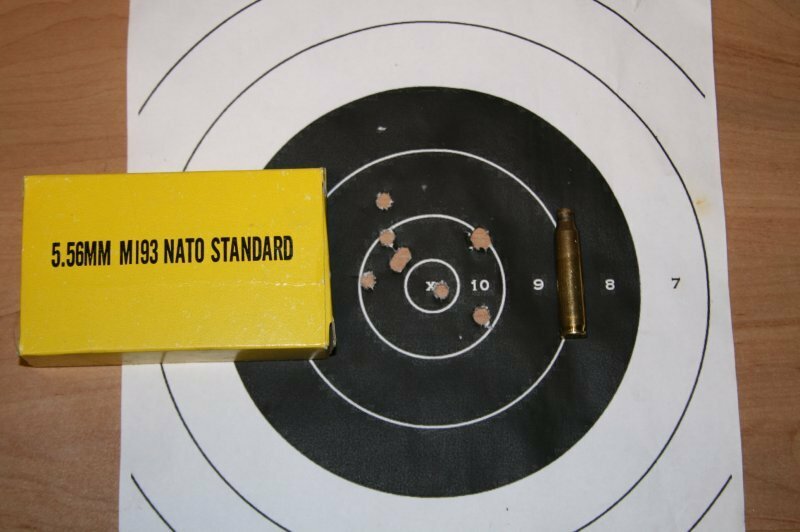 Accuracy was ok considering the ammo was cheap as chips £14 per 100 5.56mm surplus 55gr Norinco with a few mags of 62gr RG, unfortunately I only realised the scope was very loose after spending ages wondering why it would not zero. 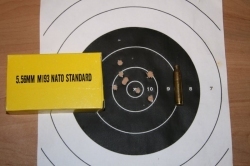 Once I was zerod the rain was lashing into the 100m firing point and combined with the dark low clouds I could barely make the target so I blatted off the last few rounds and could only recover the last soggy target from the butts as the rest disintergrated. Spec: 20" Border stainless barrel 1/8 twist fitted with A frame fore sight, flash hider and YHM free float handguards (thanks Clayton). 9mm upper (no forward assist etc) right hand straight pull but with T handle incase I want to use Ciener kit later. Sabre Defence lower with single stage Jard trigger and standard stock. Just need some decent mounts as mine were poor quality, and want to swap the EB Super Sniper 10x42 for a 20x42 as I could not see the holes in the target, I have the 20x42 on my Remmy 700 and it's perfect. Overall a great rifle, built and delivered in under 3 weeks and thanks Mark for being flexible and using parts from your spares bin and bits from me to keep costs down. Need to have a crack with .223 target ammo and reloads to really get a feel for accuracy but it's fantastic as it is.